This week’s close up is going to examine one of Brixton’s most famous landmarks - yes, it’s The Ritzy! A brilliant local cinema for residents, with the main screen usually showing the latest blockbusters while other screens show foreign language, low budget or the newest art movies; there’s even children’s cinema in the holidays. This includes mother and baby screenings, documentaries and also special seasons focused on local communities, so something for everyone. And if you’re feeling peckish you can meander upstairs to the cute little cafe-bar for a taste of live acoustic music and test your skills through the film quiz. The cinema’s stood on the corner of the famous Coldharbour Lane for 102 years now. The Ritzy started life as the Electric Pavilion and was one of the earliest purpose-built cinemas with some 750 seats. However, its earliest reception was not exactly an enviable one. The Pavilion was known as a ‘flea pit’, with a leaky roof and viewed as a poor cheaper alternative to the Paladium. The Ritzy story’s pretty full on - it’s outlived competition, survived The Blitz and even avoided demolition in the seventies! During the Second World War the neighbouring Brixton Theatre was completely destroyed by a highly explosive bomb in November 1940. This, ironically, turned out to be a blessing for The Ritzy. The cinema capitalised on the void and expanded its borders onto the site where the theatre originally stood. The bar and cafe were quickly added, contributing towards the cinema’s future success. The cinema then underwent a number of name changes - from ‘the Pullman’ in 1954, then changed to ‘the Classic’ ten years later. Unfortunately the cinema closed in 1976 in a state of disrepair, the whole place was abandoned and falling apart. A stroke of luck for the Ritzy was when Lambeth council purchased the cinema. It would have normally have been demolished but plans to redevelop the town centre were in the pipeline and the council wanted to use the building productively. One man called Pat Foster, suggested that the cinema should be reborn as an art-house cinema instead of as a carpet warehouse as originally proposed. Luckily his ideas were accepted. Pat then advertised in Time Out Magazine for four people to put up £2,000 each and succeeded in his request. With £10,000, the group had a rent-free period, courtesy of the town hall and they certainly made the most of it! The cinema opened to the public in April 1978 as “Little Bit Ritzy” in a much improved state. The aim was to show less commercial films alongside popular blockbusters. 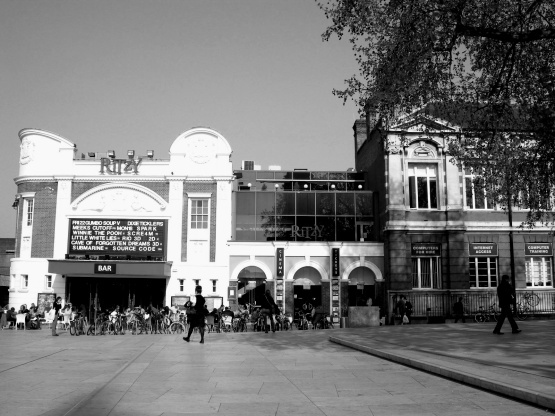 To date it’s one of the most successful independent cinemas in South London. Eventually it became known as just ‘Ritzy’ as it remains today. As popular as ever, celebrities such as singer Adele, film director Quentin Tarantino and Arctic Monkey frontman, Alex Turner, frequent the venue. And Ritzy’s not resting on its laurels - with more redevelopments in the pipeline. One thing’s for sure - Brixton wouldn’t be the same without it!